“The Kinks Choral Collection by Ray Davies and the Crouch End Festival Chorus” sounds like the kind of thing you’d buy an elderly grandparent to convince them that rock ’n’ roll is “real music.” (Alternately, it sounds like something they’d play in an especially discerning Home Depot.) But Davies’ songs, especially those on The Kinks’ pastoral masterpiece The Kinks Are The Village Green Preservation Society, have often hearkened back to an older way of life, one arguably better represented by a choral ensemble than a group of scruffy-looking rockers. The medley which knits together half a dozen Village Green songs is surprising, but even more so is The Kinks Choral Collection’s take on “You Really Got Me,” which melds the crunch of Davies’ rock band with a tidal wave of harmonies. Davies (whose name, incidentally, is pronounced without the “e”) has been especially productive in recent years, recording two solid solo albums even after being shot during a robbery in 2004. Currently on tour (mostly without choir), he’s also been talking about getting The Kinks back together for the first time in more than a decade, although his brother, guitarist, and sometime sparring partner Dave is still recovering from a stroke. Davies recently gave The A.V. Club a ring to talk about William Blake, getting kicked out of choir, and why naïveté is an artist’s best friend. The A.V. Club: The transferring of rock ’n’ roll songs to a choral context has resulted in a lot of lousy albums. What made you think that this one could be different? 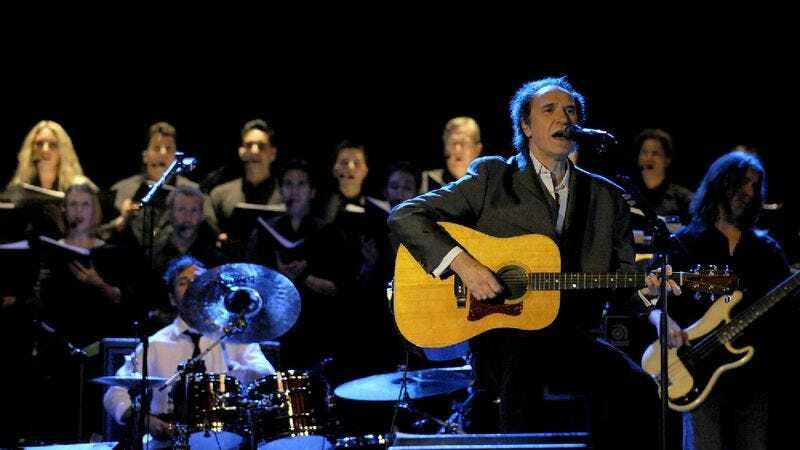 Ray Davies: I haven’t heard any of them, I’m not aware of any. You know, I don’t research things much. I was commissioned to do this. It’s something I wouldn’t have done knowingly otherwise. But it was my idea to do a concert with the choir, the Electric Proms concert for the BBC. It was a collaborative thing, but didn’t think it would go any further. But the concert was such a success that—because I had the same fear, too. Lots of raised eyebrows and quizzical looks when I said I was going to do it. I think everyone was quite relieved when it went very well. I think the issue is that I’m not aware of any other versions—maybe you can fill me in—of choir with rock. It can be quite, quite troublesome, simply because of the dynamic issues, with drums and guitars and things. But fortunately, I had a bunch of sensitive musicians around that time, and my touring band has been with me on and off for about six years now. They’ve developed quite an understanding of the way I work. AVC: Was that kind of music that was around when you were growing up, in your house or at church? RD: It was just part of growing up. I went to a Church Of England school, but the headmaster was also the choirmaster, so we had to deliver in that respect. I was doing all right in the choir, but I did get rebellious after a few years. I wanted to play football with my mates instead of rehearse, so I deliberately sang out of tune at rehearsal. I remember it clearly. I was banished when someone snitched on me. But it seemed to be always around, in Muswell Hill, essentially in Highgate, the old world of church. Every little district had a couple of churches, at least, and there was always a choir in every one. When I started making rock music, I didn’t really think about it anymore. Must have had an impact on me, because it was part of the fabric of growing up and going to a Church Of England school. AVC: The cover image is by William Blake, which seems like a pointed choice in addition to being a striking image. What inspired that? RD: Well, you know, he wrote one of the greatest lyrics ever, I think. RD: “And did these feet in ancient times walk upon England’s green and pleasant land.” I grew up with that hymn. I sang it in school. But also, when I found out more about him, he was a real Londoner, he was a Cockney; he left London once, I believe, and he wrote “Jerusalem” while he was out. I don’t know how much you know about him, but he was an engraver. He was almost like one of the first pop artists. He did his writings and he illustrated them himself. I’m sure nowadays he would have been a video artist making his own videos for his music. When I first did the Electric Proms, for some reason I remembered William Blake living in North London for awhile—he lived in Lambeth, but he lived in all parts of London. He stayed in Highgate for a while, near to where I live. And they say that he believed he could talk to the angels on Hampstead Heath if he sat in a tree. So he’s kind of eccentric, to say the least. But at the Electric Proms, I called the choir my singing angels, because they come from North London. That sort of stuck with me. And there’s something naïve about him that I relate to. His drawings are very simplistic, but the images are so powerful. I’m not fond of everything he wrote, but some of his literal imagery is really fantastic. As the record was all made in North London, around Hampstead and Highgate and Muswell Hill, it was a natural inclusion, William Blake. I’ve referred to him in other work I’ve done in the past. In “20th Century Man,” I sang about what has become of the green pleasant fields of Jerusalem. I’m a bit of a fan of him. He was wacky, slightly oddball, considered to be mad, even today. So I thought he was appropriate for this project. [Laughs]. And I think the image just does sum up some of the big moments on the record. AVC: You mentioned the word “naïve” to apply to both Blake and yourself, but generally, when people talk about your songwriting, they talk about it as being extremely sophisticated and literate and so forth, especially within the context of pop music. RD: They do, and I think sometimes it’s a little bit exaggerated. I guess I refine my work to a degree, but I think the naïveness comes from the innocence of it. The naïve innocence. I can only imagine William Blake was like that, and there are many other artists like it. Without that sort of blind innocence, you don’t do the good work sometimes. It’s that that drives you on initially, the work gets more refined. The blind innocence gives you the impetus to start. AVC: “Jerusalem” is an interesting example too, because like some of the songs you’ve written, that’s a song that’s been, to a certain extent, misinterpreted as a sort of uncritical nationalist anthem, when it’s actually full of dark and terrible imagery. AVC: The same could go for a song like “Victoria,” which is musically upbeat, but you’re referencing the checkered history of the British Empire. RD: Well, when I recorded “You Really Got Me,” reviews said it was a bit like a Gregorian chant, so I took that to heart on this, and I started it off more Gregorian-like. In fact, I did demos to most of these choral arrangements before I went to the arranger, the choirmaster. The demo was really out there, from outer space, and they said, “We can’t really deliver this. You’ll have to go to the Far East to get people to sing like that.” So that’s a refinement, but it’s alluding to that early reference people made when “You Really Got Me” came out. My version of blues, but the way I was writing music may have been influenced by the chants. I’d heard some music like that. AVC: What’s interesting is the way you use the massive sound of the choir to evoke that enormous distorted guitar on the earliest Kinks records. AVC: When you hear it’s going to be Kinks songs with a choir, you naturally worry it would take itself too seriously, but it doesn’t. RD: I really tried. I didn’t want it to be a karaoke record. At the same time, I didn’t want to take it too seriously. And the arrangements, I think, reflect that. AVC: Going back to Blake, your songs touch on a complicated vision of Englishness, not purely nostalgic, but touching on the darker undercurrents as well. It’s evocative of some of Michael Powell’s movies. RD: Michael Powell? I’m so flattered. I think he’s brilliant. You mean A Canterbury Tale? AVC: I Know Where I’m Going! RD: Right, okay. And a lot of his stuff is God-fearing. Blake and all those Victorian artists—there’s an artist called John Martin, and his apocalyptic vision is pure God-fearing, and the darkness of the Victorian era that I guess lends itself to my darker humor or darker sides. I’m happy to be part of that tradition. AVC: So if it wasn’t Gregorian chant, what inspired that early guitar sound? AVC: The very slow, swelling intro is a wonderful way into the record. On “You Really Got Me,” you orchestrate a striking back-and-forth between the sections of the choir, and have the basses actually singing the bassline. RD: Yeah. [Laughs.] I won’t go to Harvard on it. It’s pretty basic stuff. I think it’s effective. And I think it keeps the spirit of the original records: raw, hopefully, and energetic. AVC: In the liner notes, the choir director is credited with arrangement and you’re credited with re-arrangement in post-production. How did that work? RD: What I did, I did my madcap arrangements and got together with the choirmaster David [Temple], and his arranger, Steve [Markwick]. The thing about a great choirmaster is that you may have a hundred voices, but you know the strength of each singer. I’ve learned that choir singers are not great soloists, generally; as an ensemble, they’re really good. So we refined what I took in, worked out a sketch, and did the arrangements from there. Then after it was recorded, I had to do re-arranging on “See My Friends,” for example—I completely re-patched it and re-arranged things. I decided after hearing the rhythm track that it didn’t really gel, and so I decided to do it completely a cappella, and I shifted the arrangement around. That was how I referred to re-arrangement. AVC: Did that have to do with just remixing different parts of it? RD: Sonic things, yeah, remixing, and moving vocal lines around. AVC: The album sounds as if it were recorded in a continuous take, especially the “Village Green” medley. Was that actually the case? RD: That’s the objective. I think the best way to hear it is not to read the liner notes or the song-track listings, but listen to the record. It’s meant to be a continuous listen. AVC: Between curating the Picture Box boxed set that came out last year and putting together this album, you’ve been spending a lot of time looking over The Kinks’ past. What about the future? You’ve been talking about reuniting. RD: Well, the band without Dave has done some—we did four tracks this year, we got Mick Avory in, because Mick wanted to see what he’s like in the studio, and Jim [Rodford], and Ian [Gibbons]. I’ve spoken to Pete Quaife and we did some tracks, and out of four or five, there are three, I think, good ones that have evolved. I’d only do it if we could do something new. And whether Dave wants to contribute… I think he does. But he’s probably doing a little workout actually the beginning of next year, to try some dates, because he had a stroke. I think he’s feeling his way. I don’t want to pressurize him too much. But the rest of the band, all the work we’ve done, tryouts and recording. AVC: Would it be The Kinks in your mind if he couldn’t or wouldn’t take part in it? Or would it be something else? RD: That’s an interesting one. I think my personal feeling is, I’d like him to contribute something. You know, you can contribute ideas without playing. I think technically, I would work around his capabilities as a player, as he’s changed his style of playing. But would it be The Kinks without him? Would it be The Kinks without me? I don’t know. If the spirit is there, it could be.